The carpal tunnel is a narrow, tunnel-like structure in the wrist. The bottom and sides of this tunnel are formed by wrist (carpal) bones. The top of the tunnel is covered by a strong band of connective tissue called the transverse carpal ligament. The median nerve travels from the forearm into the hand through this tunnel in the wrist. The median nerve controls feeling in the palm side of the thumb, index finger, and long fingers. The nerve also controls the muscles around the base of the thumb. The tendons that bend the fingers and thumb also travel through the carpal tunnel. These tendons are called flexor tendons. 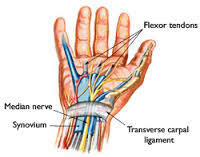 The carpal tunnel protects the median nerve and flexor tendons that bend the fingers and thumb.